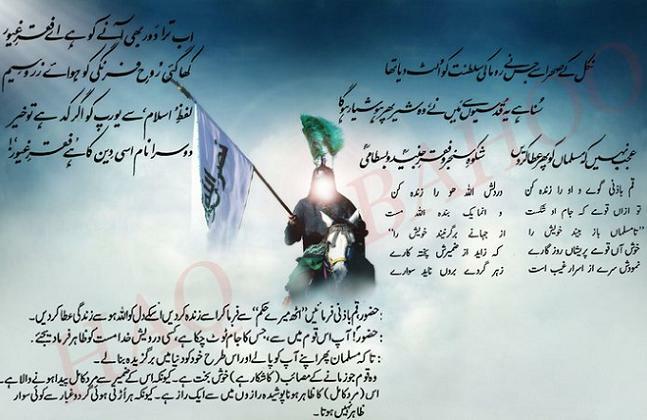 The Javid Nama (Book of Eternity), is a Persian book of poetry written by Allama Iqbal and published in 1932. It is considered to be one of the masterpieces of Iqbal. 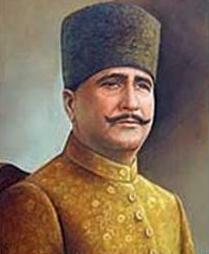 Allama Iqbal depicts himself as Zinda Rud (a stream, full of life) guided by Rumi the master, through various heavens and spheres and has the honor of approaching Divinity and coming in contact with divine illuminations. At Sphere of the Moon, they met an Indian ascetic, known to the people of India as Jahan Dost. Suddenly an Angel appeared and revealed the glad tiding about real revolution. وہ قوم جو زمانے کے مصائب کا شکار ہے خوش بخت ہے کیونکہ اس کے ضمیر سے، مرد کامل پیدا ہونے والا ہے. You have a strength and passion of love for Ummah and Pakistan. May Allah bless you with more knowledge and wisdom and you may continue spreading the knowledge you get. This is the work, which other people who have the knowledge should do too. Brothers and sisters,who like this blog and agree with this cause should spread this blog on the other sites and social networks. May Allah give you the strength to spread the love of Allah, love of Rasool Allah, love of Islam, love of Muslim Ummah and love of Pakistan. Me too the "MUHIB" of Pakistan like Sufi Muhammad Barkat Ali Ludhynavi R.A. I would like to meet you Faqr bahi, if you live in Lahore. Is it not possible that we can have a meet? would love to be in interaction with like minds. Preshan na hon, ab to Pakistan ke ache din ane wale hain. Allah ki zaat zaman-o-makan se pak hai, Uss ki nishaniyon aur qudrat se Uss ka pata chalta hai. Pakistan to Allah ka maujaza (miracle) aur bohat bari nishani hai, jo ahl-e-ilm hain wo jante hain k Pakistan Allah ne aik khas maqsad k liye banaya hai. Agle dour mein Islam ka dobara bol bala hona hai iss ka aghaz Pakistan se hona hai. bus jab waqt aa jaye ga to halaat theek ho jaen ge. Har kaam mein Allah ki hikmat hoti hai. Allah intihai ghairat wala aur insaaf wala hai, ye jo kuch bhi ho raha iss liye hai k log Allah ki taraf rajoo karain. Actually ye ashaar nahin hain, ye Allama Iqbal Ahadith ka mafhoom bayan farma rahe hain, Kufr aur dajjal ke dour ke baad dobara Islam ka dour ana hai jab Islam sari dunya mein phail jaye ga. Asal mein Rasool Allah (S.A.W.W) ne qayamat tak ke tamam waqiyat byan farma diye thay ta k baad mein aane wale musalman gumrahi aur galat logon se bach sakain aur zamane ko pehchan sakain. Jitne bhi Auliah Allah hain wo Quran aur Ahadith ke gehre ilm ki wajah se ye batain farmate hain. First, thanks a lot, actually this is the real knowledge and wisdom of Muslims which is being deliberately kept away from us in these days. Unfortunately, we have lost our heritage of Basirat, Hikmah, and ethics. We lost Urdu, Arabic and Persian by our educational system and now following the faithless civilization of West. I become so much depressed when I couldn't understand the books of our Saints because I don't know Farsi and Arabic. Its an attempt by me to dive in the ocean of spiritual knowledge and try to find some pearls. About meeting, actually we all live in different locations and best place to meet is this blogs or through emails. Main things is our search of truth & knowledge which we can do by sitting at computer. You see, this internet is blessing if we use it properly to increase our knowledge of Islam. AJ jo faslah sunaaya geya hae yousaf raza gillani kay khilaf app iss ko kiss tarha say dekhtey hai kiya qoum kay sath khel kehla ja raha hai. laanat hai aaj jo fesla aaya hai uss feslay per bhi,aur sunanay walay per bhi !!!!! Mein ne bht pehle iss forum pe kaha tha ke justice iftikhar ki niyyat mein khott hai,aaj yeh baat saabit ho gayee hai. 30 second ki saza denay se behtar tha ke na he datea saza kyun ke gar saza na hoti toh shayad kuch na hota lakin itni anokhi aur braye naam saza denay se puri duniya ham pe hans rahi hai ke yeh saza hai ya mazaq? iss se zada saza toh bachay chor aur police ke khel mein ek dusray ko de detay hain. Afsos ke gharib ke liye qanoon sakht se skht tarr hai lakin umra ke liye mazaq. Mujhe p.m se zada ghussa iftikhar chaudhary pe hai ke p.m toh tha he corrupt,iftikhar chaudhary ne bhi apne aap ko na ehl saabit ker dia hai. mubashhar luqman ne bht pehle he iss dhongi adliya ka raaz khol dia tha awam ke samnay. jis muashray se insaaf uth jaye aur awam bhi be-insafi par mabni feslay chahnay lagein,tabahi uss ka muqaddar ho jaya kerti hai.aap log sirf iss baat pe bharosa ker k bethe raho ke upar se farishte ayen ge,mizarat se buzurgan ayen ge,aur sab ke mindset bhi thek ker daen ge,aasman se aur zameen se khazanay barsain ge. I think this is why earthquakes and natural disasters are heading our way. Why we are complaining?we shouldn't. Morally we are in the depth of the earth. I think each person should ask for His forgiveness. Our nation is running around rotti by hook or by crook.May ALLAH have mercy on us.We are in serious trouble. I think that if, according to the Aulya e Karam's promised leadership of Pakistan present at this time, than they would hang these corrupt judges in the first place from the poles and trees. Mr. Itezaz Ahsan is the devil in the cloak of sheep. He was the biggest traitor in the "Adliya bahali tehreek".who disband the tehreek in halfway,when the zardari govt was about to collapse. and what did judges themselves do?they have been playing with the sentiments of public and just acting to ensure the accountibility!!!!! nothing more than that.It is the flaw of this bogus judiciary system.months ago,i posted sura e maidha's verse 44-52 if i am not wrong.These verses actually declare that people who do not judge according to the guidance provided by Allah,are fasiq ,zalim ,kafir. So is the case of mr. iftikhar chaudhary. Actually the refernce sent by musharraf against justice iftikhar was'nt too bogus.it contained charges about his son who despite failing in the test had got a federal job and then he got transfers as per his wish.His nephew used his helicopter for transportation and bla bla bla. There was actualy some potential in that refercne but unfortunately media which was fed up by musharraf by then,used this refernce against him and exeggerated it.lawyers also participated in it bcoz they wanted to see their clan as the most powerful profession in Pakistan. According to Hassan Nisar's words "Every one here is biting every one. "Its a bash where every one is competing everyone. A strictly religious revolution similar to that of Iran is needed although the risk of innocent killings and personal vendettas in the disguise of revolution is always there. fakhr sahib/shiba aap ne mera last comment publish kyun nahi kia ? The decision made by supreme court bench against PM and the behavior of the government is a shame to the whole nation and another black spot on the face of the history of Pakistan. But people do not understand it.Remember, what hazrat Naimatullah shah wali predicted about the corruption of the Qazi or judges. I request Faqar brother to please pulish these predictions about Qazi,Judges again.